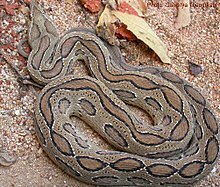 Etymology: russelii: named in appreciation after Scottish herpetologist Patrick Russell, who first described many of India's snakes. For more multimedia, look at Daboia russelii on Wikimedia Commons. This page was last edited on 19 February 2019, at 12:34.